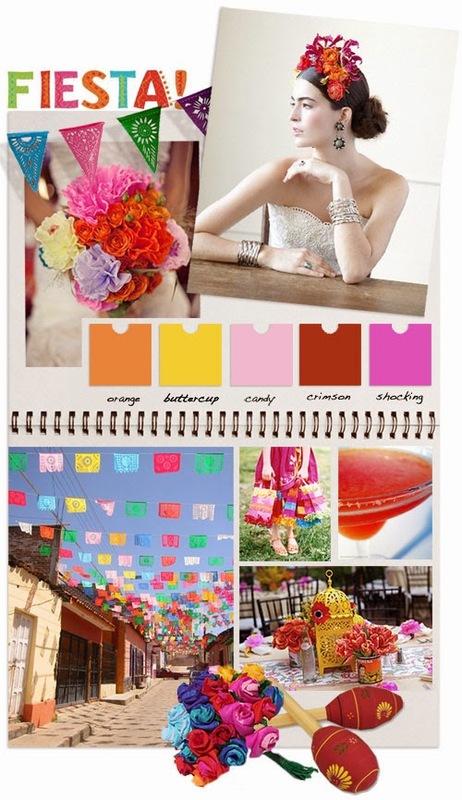 Grab your maracas and get ready for a fabulous fiesta with some beautiful DIY Mexican inspired wedding ideas. Pretty lapel picado fluttering in the breeze, bright colours and a margarita or two. 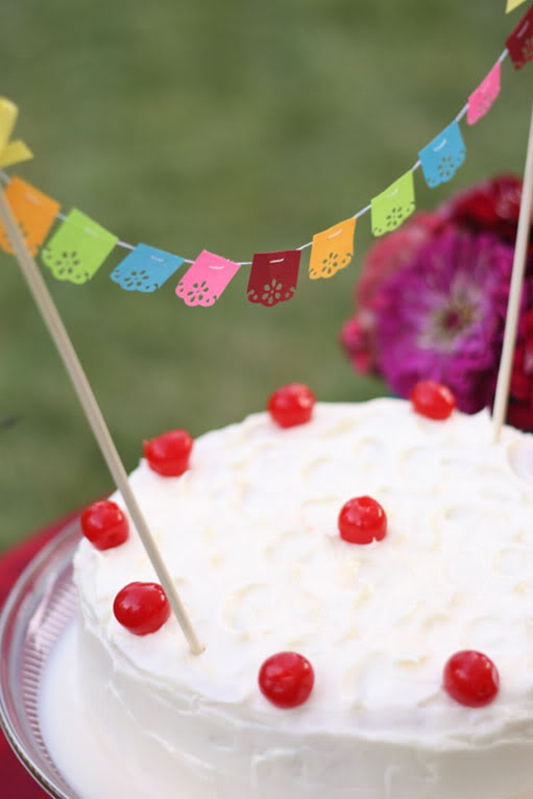 Credits: Mexican paper flags make the perfect decorations, pic by Jamie Meares. A beautiful Frida Kahlo inspired bride from Seattle Bride Magazine photographed by Zee Wendell. A vibrant bouquet of handmade paper flowers. Photo by Joielala Photography via Green Wedding Shoes. A street decorated with pretty paper picado banners, by Emilano Rodriguez. Cute party packs for take home treats via Martha Stewart. Margaritas are a must! Try this Strawberry version from Mix Shake and Pour. Pretty painted Mexican lanterns make great table decorations, pic via Camillestyles. Mexican paper roses from All Pop and don't forget your maracas! 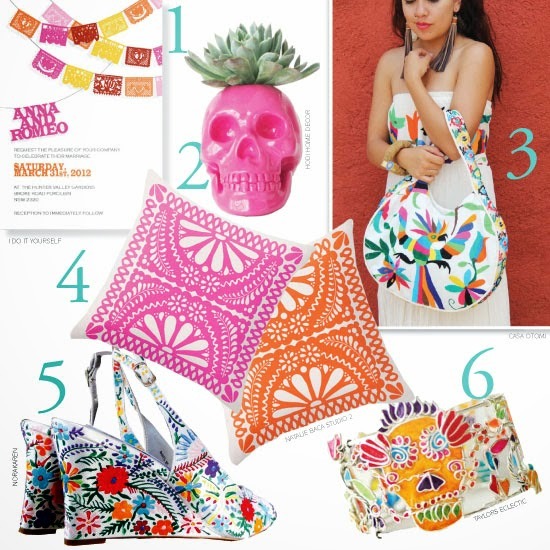 Get all the colour and pattern of a Mexcian fiesta! 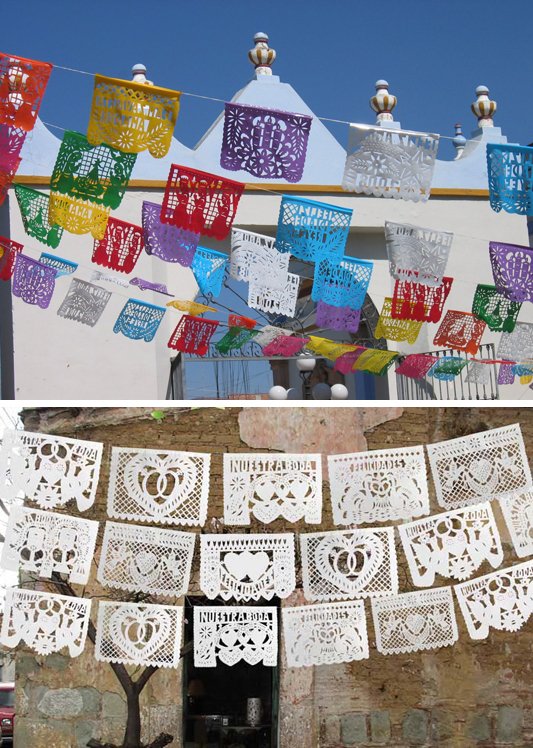 Papel picado is a beautiful Mexican folk art tradition of cutting elaborate designs into colourful tissue paper, it basically means 'perforated paper'. Using a small hammer and chisel an artist can create as many as 50 banners at a time but there are plenty of ideas for a DIY bride armed with a pair of scissors. Step 3. Cut small shapes and patterns into the folded paper, its just like making a snow flake when you were a kid! Use some decorative edge scissors to cut along the ends of the folded paper to finish. Step 4. Unfold your design and repeat with the rest of the tissue paper sheets. Step 5. When you have cut out all your panels, smooth out the creases with a cool iron and stick each one to a long piece of string with a little sticky tape. For very simple versions there is also a cute tutorial on Green Wedding Shoes. 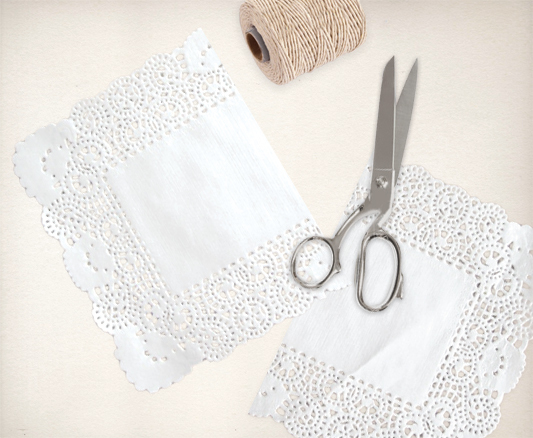 And here is a great cheat version - just use rectangular doilies! Cut them in half, fold a little flap over the top of some string and fix with sticky tape. 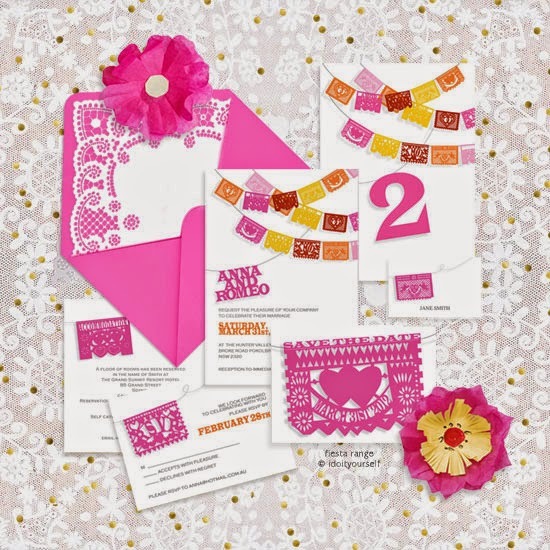 Pretty papel picado fluttering in the breeze is the focus for this beautiful printable wedding stationery range. 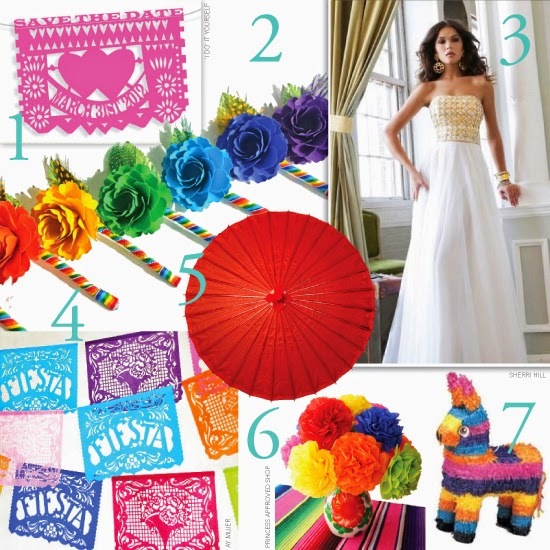 Full of colour and fun, this design sets the scene perfectly for a fabulous fiesta wedding. Shown here in a mix of shocking pink, buttercup, crimson, pumpkin and candy pink - or pick your own colours from our huge selection. The Fiesta range is available from the 'i do' it yourself shop. 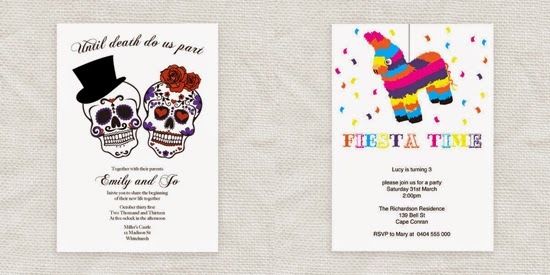 For even more Mexican themed invitations check out our sugar skulls design, Until Death Do Us Part, and our cute little burro piñata invite, great for kids.